As previously reported in Zmail, The Lower School opened Women's History Month with an assembly for grades 1-4. The following highlights activities that have taken place in the classrooms to date. 1st grade: In their General Studies classrooms, students read the book The Girl with a Mind for Math: the story of Raye Montague. (Raye Montague was the first female engineer for the Navy.) They then followed up with their own engineering project. Using chickpeas and toothpicks students created geometrical shapes and built structures using those shapes. In Science class students explored insect and flower adaptations as they learned how the observations of Maria Merian in the 1600's helped others understand metamorphosis. 2nd grade: In their General Studies classrooms students connected to their social studies study landmark unit as they learned about Emily Warren Roebling, who helped complete the Brooklyn Bridge when her father-in-law became paralyzed and her husband became ill. Students then engineered their own bridge and tracked the number of cubes needed to keep the bridge in balance. In Science class students learned about Erin Bell who designed The Living Bridge Portsmouth Memorial Bridge. They then designed their own "living bridge", choosing "sensors" to install on the bridge to study water, animals weather light, walking paths and bicycles paths. In the Art Studio students learned about American sculptor, Louise Nevelson and her use of found object in her work. Small boxes were collected and students were then inspired to create wooden relief sculptures using boxes as their base. 3rd grade science: Inspired by Isatou Ceesay of West Africa and as part of it Biomes unit, students explored solutions to reusing, reducing and recycling plastic bags. 3rd grade and 4th grades: In the Art Studio students were inspired by the work of contemporary artist Jen Aranyi. They created original winter themed landscapes highlighting the elements of art such as line, shape, form, and color. 4th grade: In Science students learned about Ruzena Bajcsy and her contributions to robotic sensors. They then debated the pros and cons of robots in our lives. In music, students in all grades studied the life of Marian Anderson, one of the most celebrated singers of the twentieth century and a role model of courage. 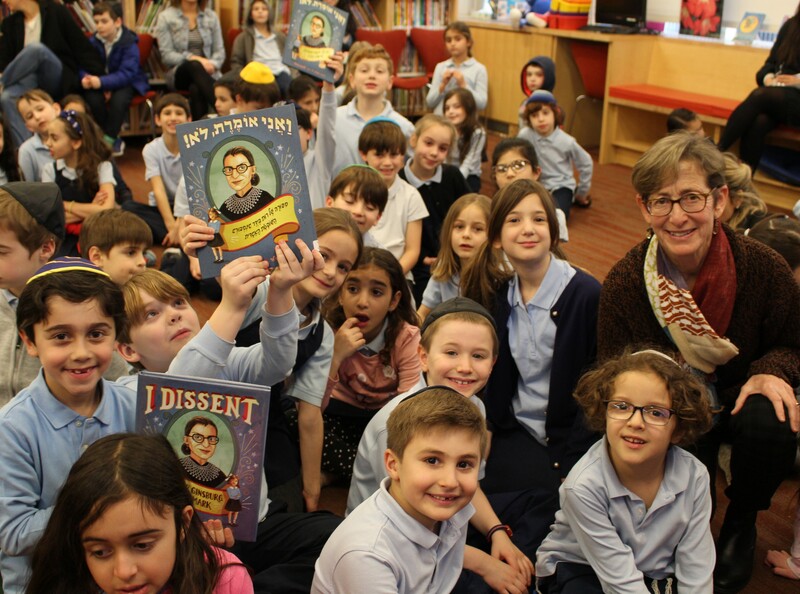 Students in all grades enjoyed a visit and presentation from Debbie Levy, author of I Dissent: Ruth Bader Ginsburg Makes her Mark. Students heard the inside story behind the creation of the book and had an opportunity to ask questions about the writing process and about RBG herself. In the library, students in all grades learned about a number of female chefs (Julia Child, Edna Lewis, Alice Waters, Buwei Yang Chao, Ruth Wakefield) and enjoyed a lunch inspired by these women. Stay tuned for more to follow..